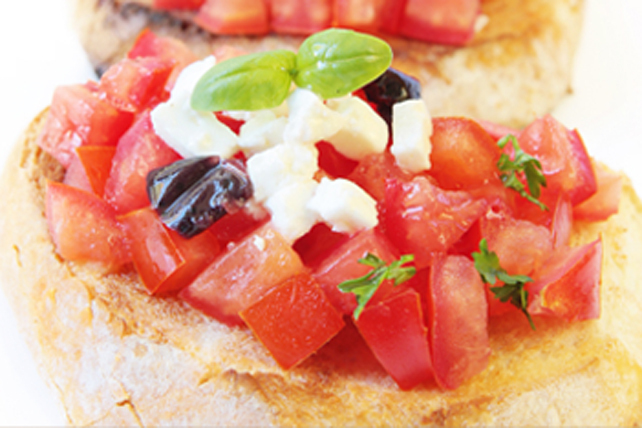 A fun twist on the classic appetizer, this easy-to-make bruschetta is the perfect way to kick off your next gathering of friends. Add half the marinade to tomatoes in medium bowl; mix lightly. Brush both sides of baguette slices with remaining marinade; place in single layer on parchment-covered baking sheet. Bake 4 to 5 min. on each side or until golden brown on both sides. Cool. Spoon tomato mixture onto toast slices just before serving; top with cheese and olives. Garnish with fresh herbs, such as small fresh basil leaves or chopped fresh parsley, before serving. Letting the tomato mixture stand at room temperature while preparing the toast slices allows time for the flavours to blend.